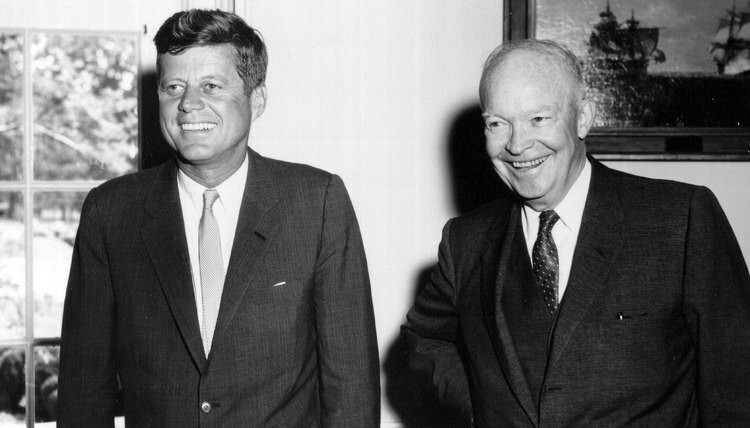 Presidents John Kennedy (left) and Dwight Eisenhower were both avid golfers. Most U.S. presidents of the 20th and 21st centuries played golf, either for personal recreation or as a vehicle to help them achieve their political ends. While several presidents were solid athletes, the scholarly Woodrow Wilson likely played golf more often than any American chief executive. But he reportedly played for health reasons, on the advice of his doctor. For pure love of the game, Dwight D. Eisenhower ranks first among the presidents as of 2012. Dwight Eisenhower was an excellent youth football and baseball player who eventually played football while attending the U.S. Military Academy at West Point. His football career, however, was cut short by knee injuries that prevented him from running. He took up golf at age 37, teaching himself a swing that didn’t involve twisting his bad knee. He eventually shot in the low 80s consistently, according to the Eisenhower Memorial website. As president he played two rounds per week and -- using donated funds -- had a putting green installed on the White House lawn. Eisenhower became a member of the Augusta National Golf Club, home of the Masters, before serving as president. He made 29 visits to Augusta during his two terms in office, and the club built a small cottage where Eisenhower stayed during his weekend visits. Longtime club chairman Clifford Roberts, a friend of Eisenhower, reported that Eisenhower broke 80 four times on the course. Roberts also stated that Eisenhower was the most enthusiastic golfer he’d ever met. Before Eisenhower took office, golf was considered a rich man’s sport by many Americans. Eisenhower, who was far from rich, helped change the game’s image. As of 2012, Eisenhower is the only president to be inducted into the World Golf Hall of Fame, which reports that the American golfing population doubled to 6.4 million during Eisenhower’s eight years in the White House. What Is the Origin of the Dinah Shore Golf Tournament? What PGA Golfer Is Known as 'The Grinder'?